Viking Dextrin Malt has an outstanding flavor after going through special steeping and germination conditions and prolonged kilning program. During first steps of kilning the green malt is put through demanding kilning conditions before long lasting mild drying period. The amylolytic activity of this Dextrin Malt is modest. 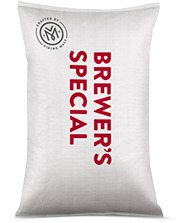 Viking Dextrin Malt can be used in grists for ales and lagers to give fullness and sweetness in overall taste, supporting good head retention. As Dextrin Malt is light colored with not too overwhelming taste dosage rate can be up to 30%.